The recent move in the commercial robotics market to include toy-like devices and home-built kit robots was clearly in evidence at the 2007 International Robot Exhibition, held in Tokyo this weekend. Small robots, such as Pirkus, Gogic Five and others that have been selling well in the void created by the absence of Sony's Aibo were big draws at the show, although there was still room for their larger, more advanced cousins. 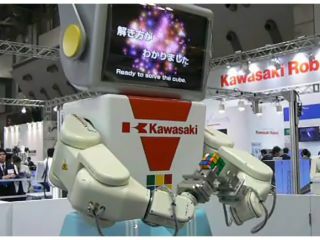 Of the robots that weren't for sale at any price, the most popular were a machine from Kawasaki Heavy Industries that solved a Rubik's Cube and, believe it or not, several mechanical arc welders. Kawasaki's Mr Cube was impressive for sure, but it took over five minutes to solve the cube. As any fool knows, the human world record is well under ten seconds, although that didn't stop Mr Cube gleefully showing off his handiwork to the crowd. While machines like the welder may be the most technically impressive, it's the little robots swarming into homes across Japan on the back of events like this one that we confidently predict will soon be commonplace in the West too. For more photos and video from the show, be sure to check out the special report at Japanese website Robot Watch - it's well worth a look even if you don't know the language.